Best Steak Marinade in Existence - soy sauce, olive oil, lemon juice, Worcestershire sauce, garlic, basil, pepper, cayenne and parsley. I have to admit, this actually might be the best steak marinade I’ve ever had. It is packed full of flavor and doesn’t use any crazy ingredients. Marinate all day for maximum flavor! When I saw this recipe on allrecipes.com I couldn't resist trying it. I mean, with a name like "Best Steak Marinade in Existence" how could I not test it out? I have to admit, this actually might be the best steak marinade I've ever had. It is packed full of flavor and doesn't use any crazy ingredients. I already had everything in the pantry to make it. We used this marinade on skirt steak and it was delicious. I plan on trying it on pork tenderloin and chicken (of course) very soon. This looks delicious! I cannot wait to try it! Thanks for posting this Stephanie. It does sound good. I was afraid this recipe was going to have Italian dressing in it. Seems like most steak marinades do and I HATE Italian dressing on anything but a salad. I just made this one last week too! Second time; the first time we made fajitas with it and added green chiles (canned) into the mix. It was great either way! Love the flavors of this recipe. I love Allrecipes.com too. I actually think I tried this recipe too. Thanks for sharing and reminding me of the great recipe! Interesting. I don't have white pepper and I never have dried parsley, but I do have a few steaks thawing for supper tonight and everything else the recipe calls for. I may give this a try... Thanks for sharing. I'm in the mood for steak, this looks delicious! Can't wait to try it. I want a plate of that. I had the same thought when I saw it and we've used it a couple of times and enjoyed it both times. I look forward to your thought regarding pork and chicken. I have used this myself and it is fantastic! I just made this last night on chicken. It was FAB! I couldn't believe I had all the ingredients on hand....except the white pepper. I can't find it at my grocery store. I've seen this same recipe and at the time dismissed it because steaks like ribeyes and strip steaks don't need a marinade. 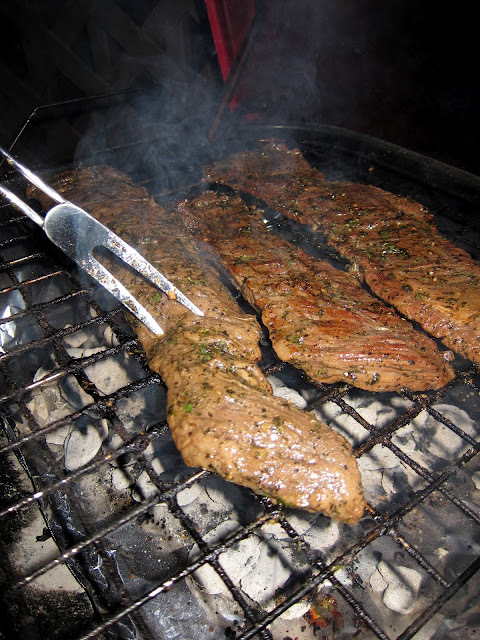 But using it was skirt steak like you did (or flank or flat iron) is a great idea. Tried it the other night -- it was delicious!! This was the first recipe I made when I started working at allrecipes for a family bbq and now barley no meat goes uncooked without this marinade! Silly question but where did you skirt steaks that big?! Sara, we got the skr steaks at The NY Butcher Shoppe in Birmingham. They have a great selection of meat. We also just bought some great looking skirt steak at Publix last night. 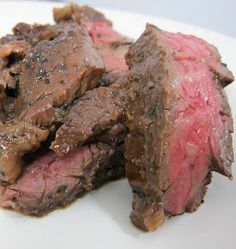 Used this one some cheap steaks and it made them nice and tender with great flavor. Thanks! Finding this marinade makes me happier than a bird with a french fry! this IS the best marinade! i make a few minor subs (montreal steak pepper mix for the white pepper, and reg minced garlic for the dried minced garlic, and no hot sauce). we love it, the company we've had over for it love it too (3 diff times now!). I normally don't eat steaks but when I tried one from a social event prepared by a catering company in Bristol, I have grown a liking to it and now, I can actually make one! Great recipe. You think I could use this marinade in the crock pot? Its getting too cold to grill here. I made this and it's incredible! I doubled the marinade and used half of it to simmer with mushrooms to top the steaks with. So, so good!! Have you ever tried slow cooking steak with this marinade? It should work fine. I've never slow cooked a steak. We always grill or pan sear it. Used this last week with a few changes. I doubled the soy saunce and threw in a teaspoon each of oregano and rosemary. Can you marinade longer than 8 hours? How long do you grill it? My husband says it really is not going to make it tender but I think it will. DO you think lime juice would work as well as lemon juice? Is this similar to what smokehouses use? This is the best marinade I have ever had in my LIFE!! We use it on every kind of meat. Steak, chicken, pork chops. Its amazing!! Does marinating with lemon juice for that long change the texture of the meat? Most marinades with acidic fruit juice left over an hour make the meat mushy or rubbery?